Cathedral, Court of Justice & Ramparts, Laon. Laon (Alaudanum or Lugdunum Clavatum in Latin ; pop. 26,000) is the capital of the département de l'Aisne. The town has a long history and flourished during the Medieval era, especially in the 12th century. Nowadays it is a quiet place off the beaten tracks, with a high density of medieval monuments for its diminutive size. The city's 11th-century ramparts are amongst the best preserved in Europe. 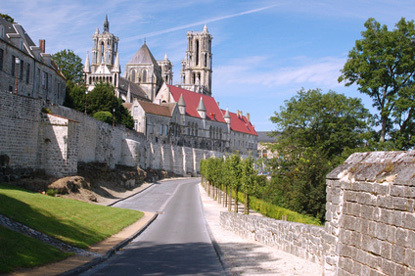 Founded by the Romans in the first century, Laon started off as a city when St. Remigius (437-533), a native of the Laonnais best known for converting Clovis to Christianity, elevated the place to the rank of bishopric. Laon was already a fortified town (castrum) in the late Roman period, and its ramparts were reconstructed and expanded during the Carolingian period. Bertrada of Laon (726-783) was the mother of Charlemagne (768-814). This gave a special status to the city, and the cathedral was indeed rebuilt in the early 9th century. After the disputed succession of Charlemagne's Empire between his three grandsons, Laon eventually become part of the Kingdom of France, with the local bishop and the King of France as co-rulers. Louis IV of France (920-954), great-great-great-grandson of Charlemagne, was born in Laon. The city experienced a dramatic development in the late 11th century, and reached a population of 10,000 in the middle of the 13th century. The increasingly frequent absence of the king allows the local bourgeoisie to oppose the episcopal power. In 1112, a municipal revolt, which caused the destruction of the episcopal palace and the cathedral, resulted in the power shifting from the bishop to the numerous canon priests. The city was later governed by a royal provost, then became the seat of the important bailiwick of Vermandois in 1237. It would loose this position to Soissons in 1596, following a siege by the Spaniards 2 years earlier. The city had already started its decline and would never recover its past glory. During the French Revolution Laon permanently lost its rank of bishopric. It is during Laon's golden age in the 1100's that most of the city's sights were constructed, such as St. Martin's Church, the old abbey (now used as a hospital), the chapel of the Templars (within the grounds of the museum of Laon) and the Hôtel-Dieu. 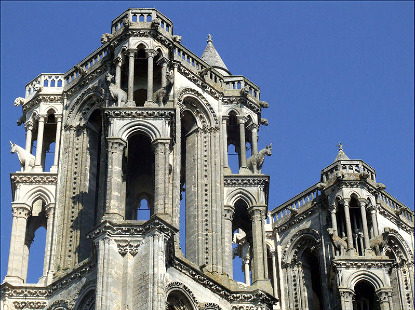 The most famous edifice is the Cathedral Notre-Dame of Laon, errected on top of the hill between 1150 and 1180. It served as model for Chartres Cathedral. Its four towers and life-size sculpted animals are particularily amazing. Just north of the cathedral, the episcopal palace now houses a court house. Laon is situated near the E17, about halfway between Reims and St. Quentin. The N2 connects it to Paris via Soissons. It is 1h30min by train from Paris, 35min from Reims and 50min from St. Quentin.